Investors are increasingly flocking to financial products that offer social as well as monetary returns, a Friends of Europe event has heard. With an estimated $6tn a year required over the next 15 years to achieve the UN’s 2030 sustainable development goals - and the world having reached “peak overseas development aid” - institutional investors and private equity firms are having to get creative, said Shada Islam, Director for Europe and Geopolitics, who moderated the event. 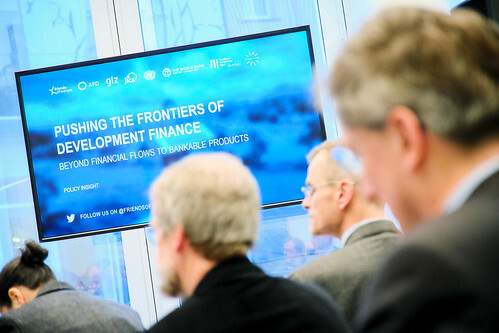 The European Investment Bank (EIB) uses ‘Sustainability Awareness Bonds’ to help fund SDG-themed projects, helping to alleviate the biggest risk that private investors face in Africa: state-owned enterprises defaulting on their payments. “The smart, targeted use of public funds to leverage private investment is key,” says Richard Amor, Head of the EIB’s Institutional and Implementation Unit. Private equity firms such as KOIS Invest are using ‘development’ or ‘humanitarian impact bonds’ to help funnel money loans (via local banks) to small businesses or female-run enterprises. “It’s not about the profits of the assets, but the impact on the ground and putting a monetary value on that,” said Béatrice Delperdange, Head of Business Development at KOIS Invest. However, there is not a “business case” for all SDGs, said Thomas Förch, Senior Technical Expert for Financial Sector Development and Insurance at the Deutsche Gesellschaft für Internationale Zusammenarbeit, calling on governments to continue playing a role in big infrastructure projects.